Galaxy simulations are a big business in astronomy these days. We’ve talked about papers that use simulations in many previous astrobites, and Nathan even wrote a couple of posts about how to use Gadget-2 to create your own. With so many researchers using simulations to probe different aspects of galaxy formation and evolution, one might begin to wonder what could possibly be left. As it turns out, the answer is a lot. While a simple simulation like the one Nathan described is easy to set up and run, creating a truly accurate model of how galaxies evolve is very, very hard. Not only are galaxies complicated to model spatially, with important structure on scales from solar systems to galaxy clusters, but they are also next to impossible to manage temporally, with relevant time steps ranging from seconds, the sort of scale important in supernova explosions, to billions of years, the time it takes for one galaxy to go from making its first stars to what we see today. With that much to consider, creating more accurate galaxy simulations is a field that can keep lots of astronomers busy for a long time. In today’s astrobite, we feature a paper that tackles one of the major missing pieces in many galaxy simulations – the inclusion of molecular hydrogen (H2). So what’s so important about molecular hydrogen? Well, as we’ve mentioned in several astrobites, observational evidence tells us that stars form in giant, dense clouds of molecular gas. So including this gas in a theoretically-motivated way in a simulation should provide a more physically accurate view of the way star formation proceeds and affects galaxy evolution. In addition, in small, metal-poor galaxies, which were prevalent in the early universe and exist today as dwarf galaxies, self-shielding of molecular hydrogen was important in helping gas cool – gas between 200 K and 5000 K loses energy via radiation and condenses into the sorts of regions where stars form (more on shielding in a moment). Because of its efficient cooling properties, molecular gas tends to lead to clumpier regions in the disks of galaxies. This clumpiness is interesting in its own right, as it can give us clues about spiral structure and overdensities in disks of galaxies, but is also important for another reason: supernova feedback. A dense interstellar medium (ISM) full of molecular would more readily absorb the energy of supernovae. This may lead to galactic-scale outflows, which have been observed in many galaxies but are not yet well understood. Essentially, correctly implementing molecular hydrogen in a simulation should affect nearly everything. In this paper, the authors simulate two dwarf galaxies, one with molecular hydrogen and one without. The abundance of molecular hydrogen in the simulation (as in reality) is governed by its formation and destruction mechanisms; H2 tends to form on dust grains, so the dust-to-gas ratio and metal content of the gas in the galaxy is important, and H2 is primarily destroyed by radiation from nearby stars, which photo-dissociates it. In addition, the density of the gas is imporant, because H2 can self shield – molecules on the outside of a cloud get photo-dissociated, but if the surface density of the gas is high enough, the radiation never penetrates to the interior of the cloud. Other than the implementation of molecular hydrogen, everything about the two simulations is the same, including the resolution, initial conditions, and supernova feedback. The simulations are then run from a very early time in the universe, all the way to today, so that the results can be compared with current observations of nearby galaxies. Color-magnitude diagram of the two simulated galaxies, overlaid on data from observed dwarf galaxies. The color is indicated on the y-axis (lower is bluer), and the magnitude, or brightness, on the x-axis (lower is brighter). The figure at right shows the two simulated galaxies overlaid on a color-magnitude diagram with a number of observed dwarf galaxies. As the figure shows, both the color and brightness of the galaxies are within the range of scatter of the observations. The somewhat surprising fact is that the galaxy with molecular hydrogen (indicated by the square) is both bluer (as indicated by its lower position on the y-axis), and brighter than the galaxy without H2. This means that the galaxy with H2 has more young stars and that there was more star formation in its past. This is surprising because in the simulation with H2, star formation is tied to the amount of molecular gas available (as opposed to being tied to the total amount of gas available, as in the other simulation). Since there is less molecular gas than the total amount of gas in the galaxy, requiring a certain density of H2 to form stars could make star formation less efficient. But in fact, the inclusion of the molecular gas makes the overall amount of star formation more efficient, because of the colder, clumpier state of the interstellar gas, which is naturally conducive to forming stars. 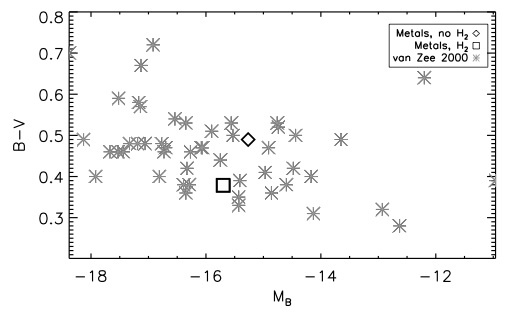 In addition to having more star formation at late times and having a larger stellar mass, the authors find that the galaxy simulated with molecular hydrogen ended up slightly larger and had more total gas at the end of the evolution. These differences can all be tied to the changes in the interstellar medium, which became colder and denser with the inclusion of H2. The increased clumpiness also led to more star formation at large galactic radii, because there were regions farther out in the galaxy with high enough densities for stars to form. All of these changes highlight the importance of correctly modeling molecular gas in simulations, as it can have a large effect on a galaxy’s size, structure, brightness, gas content, metallicity, and more.